I arrived at the airport at 10.30am, found my check-in area (zone E; the same zone as I’d checked-in to a few weeks ago) and joined the end of a VERY long queue. At the entrance to the queuing area (how much do us Brit’s love queuing?… we’ve got it down to a fine art!) was an EasyJet employee who I’d talked to on my previous trip. A couple of weeks ago he’d asked me what guitar I had in my bag and, when I’d told him that it was a PRS, he’d asked, “a Yamaha PRS?”,.. to which I’d answered, “No, a Paul Reed Smith.” Without a word of exaggeration, we had EXACTLY the same conversation when I met him this second time… I explained this to him, but he didn’t seem to remember! A moment later he came and found me in the queue to tell me, “I remember you now – I also asked you if you had two guitars in your case”. Having made a new friend at EasyJet, I finally got to the front of the queue, checked-in my case (which was considerably lighter than on my last trip, seeing as I’d left all my pedals in the Netherlands) and went through security. For those of you who don’t know, I’ve just finished writing a book – I started it in the U.S. in the summer of 2006, when I was on tour there with Carl Palmer… 3 years later and it’s finally ready for publishing! Once I got through to the airport lounge, I called my parents who had kindly offered to proof read the book for me. I talked them through the ins and outs of how I wanted them to proof read it and we got talking about the size of the book… as you can imagine from a book that’s been 3 years in the making, it’s not exactly short! In fact, in total, it clocks in at 300 A4 pages, and that’s before I’ve had a graphic designer do the layout and add photos (of which they’ll be many). So, in totally, we’re probably looking at around 400 pages of A4. This concerned me a little and, when I spoke to my parents, they also pointed out the size and suggested that I made it into two books… volume 1 and 2. I had really wanted to put everything into one book and make it the ultimate reference book – a must-have for guitarists and people interested in the evolution of style and technique of modern rock guitar playing, but I’m thinking that I could also do that in 2 volumes… mmm… gives me something to think about. I boarded my plane, ordered my usual mint tea and chocolate muffin and, once I’d had that, it was time for us to land (I love these 50 minute flights!). When I arrived at Amsterdam airport I received several text messages from Collin, welcoming me to the Netherlands and telling me that there was a train for his town leaving Amsterdam airport at 4pm. He also mentioned that there were some maintenance works on various routes that day, so I should check if my train was affected. However, I noticed that a train left in about 5 minutes (at 3.30) so, instead of enquiring about maintenance works, I headed straight to the platform and caught the direct train straight to Collin’s town. Thankfully, my train wasn’t affected by maintenance works, and it rushed me from the airport to Collin’s station… so quickly that I arrived half an hour before Collin or Jessica were able to pick me up from the station. Instead of waiting at the station for half an hour, I decided to try to walk to Collin and Jessica’s house. Following directions texted to me by Collin, I left the station and headed to their house… after only one brief wrong turn I spotted a familiar landmark and made my way to Collin and Jessica’s back garden, where I waited for Jessica to arrive. After a lovely dinner of fish and pasta, me and Collin went to the supermarket for some beer and ice-cream. 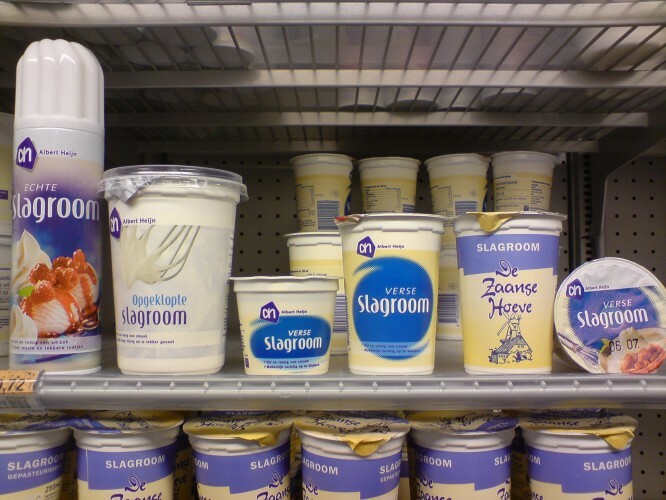 On my previous visit I’d been amused by the Dutch word for double cream; ‘Slagroom’… so we headed to the ‘Slagroom’ section of the supermarket for an impromptu photo shoot. When we got back we ate our Slagroom ice cream, drank our beer and watched a great film; ‘Thick As Theives’.